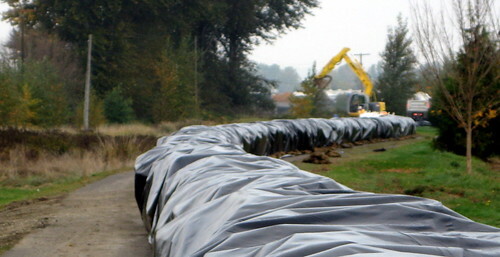 Crews are racing to erect a 3- to 4-foot high sandbag wall (above) along the trail to help contain expected floodwaters in Kent and Tukwila, Washington, if heavy rains strike the area this winter. The work stems from problems at the Corps of Engineer’s Howard Hanson Dam upstream, where engineers are concerned about the structural integrity of the dam. They’ll be releasing more water to reduce pressure on the dam, which could mean flooding downstream in the Green River Valley. The Green River Trail could be closed to bicycles for up to five years, if it takes the Corps that long to figure out how to solve and repair the problem. With the sandbags in the middle of the trail that sits on top of the levee, there’s not enough room for safe usage by bike riders and pedestrians. The less scenic, but more direct, north-south Interurban Trail is slated to remain open. Also, there are adjacent roads that bicyclists can use, although I didn’t see any detour maps or markings posted yet. “We recognize the importance of flood control in the Green River Valley, and we are glad that the trail can assist in these measures. It does impact the trail, however, and inconvenience those who use the route for recreation or workday commuting. Of course, the inconvenience to bike riders is nothing compared to the devastation throughout the Green River flood plain should the Green River crest the levees. Experts say the chance of a major flood this winter in the area that houses 26,000 people is one in three. I had read about the problems with the dam, but wasn’t aware of the public works efforts underway and the trail closures until I biked down there on Tuesday. The Green River Trail runs from Cecil Moses Park in south Seattle for 19 miles south to south Kent, near Auburn. The river appeared tranquil enough in its channel as I bicycled along the Green River Trail, which sits atop a levee next to the river. There were a few trail closure signs announcing ongoing construction in October and November, but that didn’t seem to hinder the walkers, bikers and joggers on the trail. Just south of the “Three Friends Fishing Hole” rest area, however, I came upon the sandbag work. Heavy equipment removed 3- to 4-foot square sandbags out of trucks with a heavy loader and placed them in a line on the trail while workers wrapped them in heavy black plastic. The sandbags break at South 212 Street, then continue for miles south along the levee. I headed south on Frager Road and returned by that route so I wouldn’t interrupt the work crews. When the work is done, the Kent Reporter says 20,000 giant sandbags will be in place along the 12-mile trail section in Kent. Detour routes for bicycles will be posted along the trail. Frager Road between S. 200th Street and Washington Avenue/West Valley Highway can be used as an alternate route, while the Interurban Trail between the north and south City limits will also serve north-south bicyclists and pedestrians. East-west access roads will include S. 200th/196th, S. 212th Street, James and Meeker Streets. You can click on the King County bicycle map at right to find more information about the specific routes in the area. Tukwila is preparing to use the trail as a stable platform for flood prevention measures along the left bank of the river. A sign posted in Tukwila informs that the trail from 180th Street to I-405 will be closed for up to five years. Further closures north of I-405 also are anticipated.